James Freeman, intern in Medieval and Earlier Manuscripts Section at The British Library, looks at cuttings from a huge 14th-century Italian choirbook and how digital technology is now helping scholars build a picture of the once intact original through virtually reuniting the “diaspora” of fragments. Detail from Add MS 37955 A: a miniature of the Death and Assumption of the Virgin Mary (pictured in full below). Among its rich and diverse holdings, the British Library possesses an important collection of approximately 675 cuttings from Italian illuminated manuscripts. These single leaves, miniatures and initials were catalogued in 2010 as part of an AHRC-funded project and are in the public domain through the British Library’s Catalogue of Illuminated Manuscripts. Such remnants are of obvious historical fascination, offering scholars insights into the original appearance of mutilated manuscripts or tantalising glimpses of others that have been lost or are as yet unidentified. Requiring a different approach to manuscript books in their storage, handling and interpretation, cuttings present particular challenges to the curator as well. When the British Library Conservation Centre remounted an Italian cutting in the collection – Add MS 35254 C – they revealed on its verso side music, verses and a painted initial that had previously been hidden from view. This discovery raised important questions about how best these objects should be displayed, balancing the need for both conservation and accessibility, as well as a consideration of the potential of digitisation to facilitate exciting advances in the study and understanding of bits of manuscripts that have been separated from their original context for two centuries. In 1375, at the Camaldolese monastery of Santa Maria degli Angeli in Florence, a monk by the name of Leonardo bequeathed large sums of money in memory of his father. According to the document in which this gift was recorded, 100 florins was expended upon new choirbooks: specifically, a gradual. This was the principal choirbook used in the celebration of the mass and takes its name from the practice of the choir singing on the raised steps of the pulpit. The product of Fra Leonardo’s largesse survives at the Biblioteca Medicea Laurenziana in Florence as Codice Corale 2, but in mutilated form: twenty pages were cut from the manuscript, and their remnants are now scattered among private and public collections around the world. 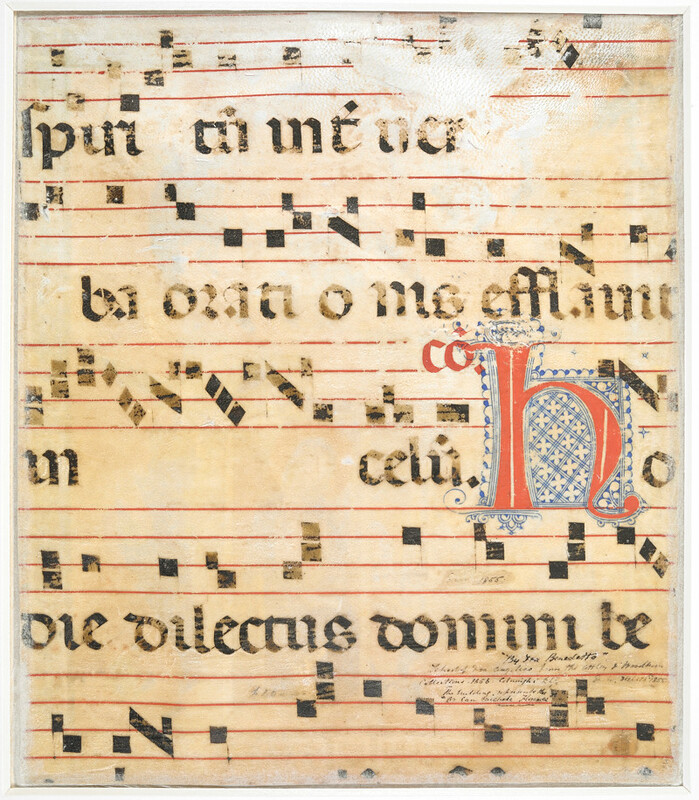 Choirbooks are often very large in size, and Codice Corale 2 is no exception (measuring 680 x 450 mm). Its leaves contain musical notation and accompanying verses written in large script and therefore legible to the choir members gathered around the book. Historiated and ornamented initials, illuminated borders, framed miniatures and other forms of decoration adorned these books, usually marking the parts of the text used for different services or feast days. The suppression of monasteries in northern and central Italy in the late eighteenth and early nineteenth century, by terminating the institutional possession and protection of such books and rendering their future ownership uncertain, created the perfect opportunity for their mutilation. Individuals could harvest fine examples of medieval painting from these unwieldy vessels of an obsolete liturgy, in response to emerging aesthetic as well as commercial demands. Add MS 35254 C: a large foliate initial R depicting the Annunciation. The present cutting, Add MS 35254 C, was acquired by William Young Ottley (b. 1771, d. 1836), an art writer, collector and amateur dealer and, in the closing three years of his life, the first Keeper of Prints and Drawings at the British Museum. He owned eleven others taken from Codice Corale 2; some were sold during his life (probably including this one), others at a sale after his death. The initial is from the beginning of the Advent prose Rorate caeli desuper. This text was used as an introit, sung as the priest approached the altar to celebrate mass on 25th March, the Feast of the Annunciation. Within a mosaic-like border, a large foliate initial R effectively divides the historiated scene into two compartments. God is borne aloft in the upper lobe on a cloud of cherubim. Below, Mary is depicted sitting enthroned, an open book on her lap, and her hands raised in astonishment. Before her, Gabriel is kneeling, the opening words of his greeting inscribed on a speech scroll. The two parts are brought together by God’s word: it descends in the form of golden rays from his mouth and right hand (which is raised in blessing), crossing the arch of the initial R, and resting upon Mary’s face. The transformation en route of these rays into the Holy Spirit in the form of a dove doubtless refers to Luke 1:35, Gabriel’s explanation of how Mary would conceive Jesus: ‘“The Holy Spirit shall come upon thee, and the power of the Highest shall overshadow thee”’. This and 37 other initials – some still in the manuscript, others in collections in Sweden, Switzerland, Portugal, Italy and the United States – were completed by another monk of Santa Maria degli Angeli, Don Silvestro dei Gherarducci. 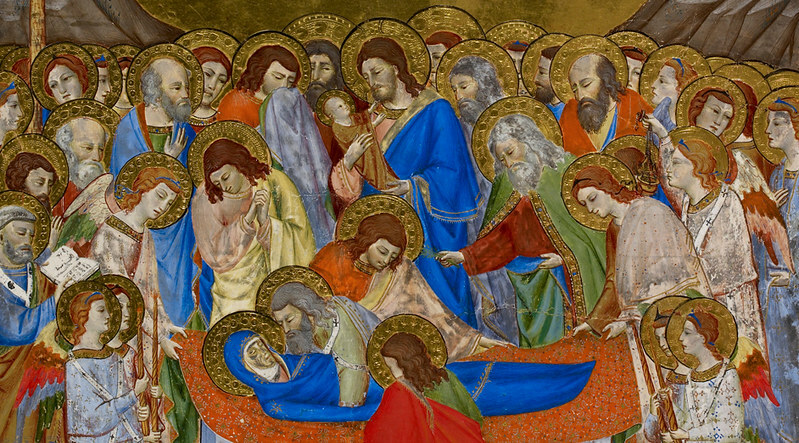 Arriving as a novice in 1348 (aged only nine), and dying as prior in 1399, Don Silvestro illuminated a number of choirbooks for the monastery as well as other artworks, such as panel paintings and altarpieces. His absence from monastery records between 1352 and 1362, and the style of his painting have led to suggestions that the early part of his life in monastic orders was probably spent not in Florence but Siena, where he may have trained as a painter in Jacopo di Mino del Pellicciaio’s workshop. 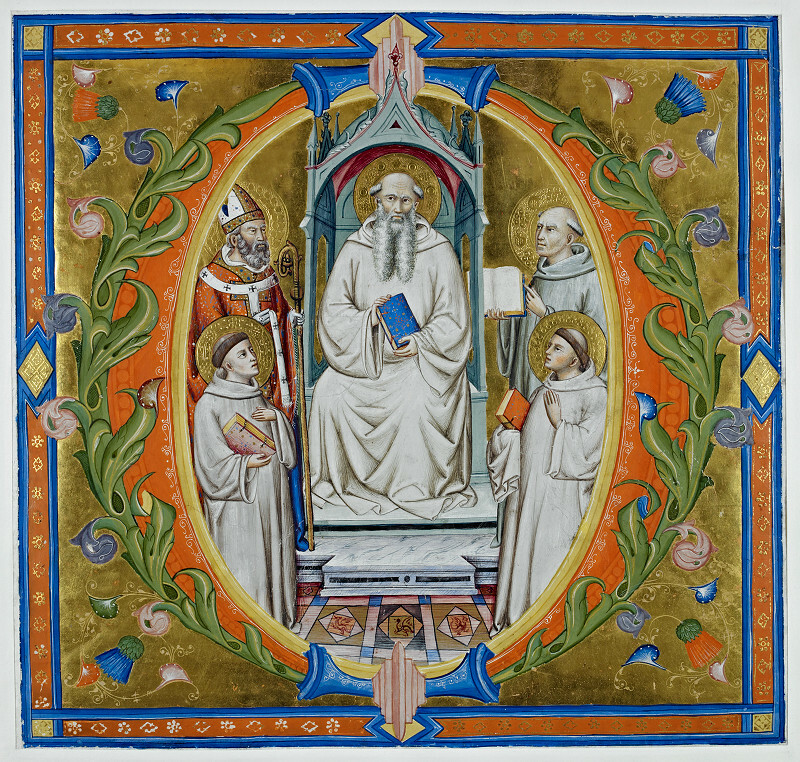 Add MS 37472 f.3: a historiated initial showing Saint Romuald enthroned. 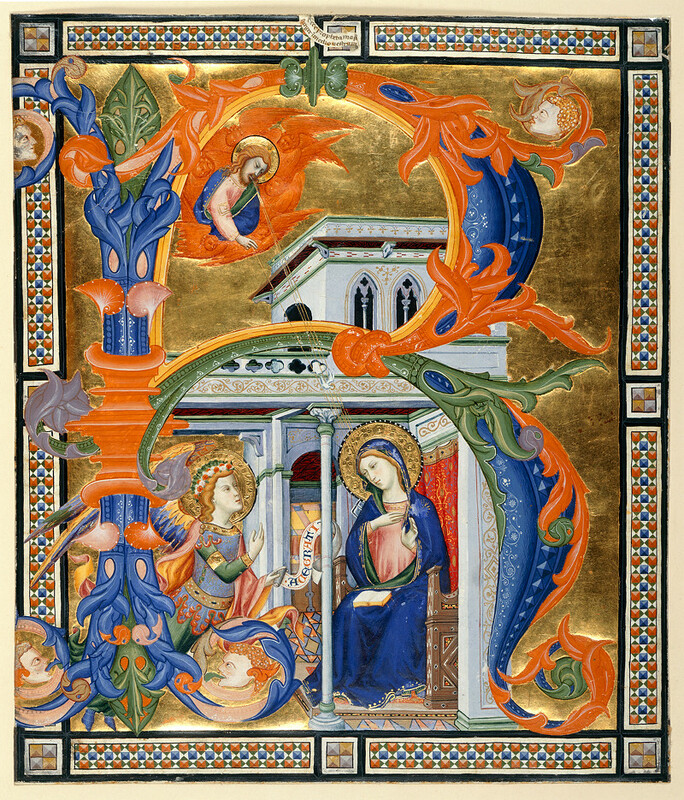 The British Library holds further examples of Don Silvestro’s work in the form of one, possibly two, cuttings from the present gradual: a historiated initial showing Saint Romuald enthroned (Add MS 37472, f. 3); and a splendid miniature of the Death and Assumption of the Virgin Mary (Add MS 37955 A – scholars have disagreed whether this once belonged in Codice Corale 2 or 19). Only one missing initial from the original manuscript has yet to be identified: the index in the manuscript tells us this was a historiated initial V featuring Saint Scholastica (Codice Corale 2, f. 49). Yet tracing the dispersal of cuttings from this manuscript is complicated by the fact that whole leaves were removed, from which only those portions containing notable decoration survive. What else might have featured on these pages, beyond what is recorded in the gradual’s index and what has been found in private and institutional collections? 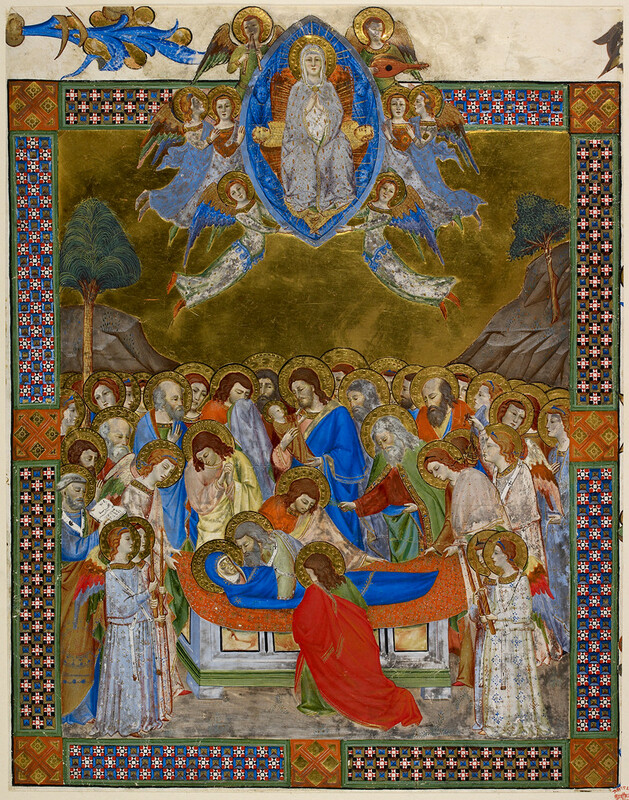 Add MS 37955 A: miniature of the Death and Assumption of the Virgin Mary. Add MS 35254 C illustrates this problem with particular clarity. Above the historiated initial, in the middle of the mosaic-like border, a small speech scroll bears the words ‘Ecce propheta magnus surget in medio vestrum’ (‘Behold, a great prophet will rise among you’). The survival of further cuttings from this leaf in the Nationalmuseum in Stockholm (NMB MS 1797) reveals that eight such scrolls were held by prophets depicted in quatrefoils around the initial at the corners and mid-points (these were recorded in the sale of Ottley’s collection in 1838). The cutting of the prophet who held the scroll that remains part of Add MS 35254 C has not yet been found. Detail from Add MS 35254 C: a large foliate initial R depicting the Annunciation (pictured in full above). As well as other forms of decoration, musical notation and text has been lost as a result of these excisions. By placing this initial in a window-frame mount, the British Library has been able to expose what remains on the reverse of this cutting. The liturgy for the Annunciation Mass continues with the offertory hymn Ave Maria Gratia Plena. The words incorporate a large red initial with contrasting blue penwork, revealing what other grades of decoration were included in this manuscript. The words that remain are complete from line to line – ‘inter verbi orationis efflauit in celum. Hodie dilectus domini be<...>’ – so something must have surrounded them on the rest of the page. Part of this must survive on the reverse side of the prophet cuttings in Stockholm. Other leaves in the manuscript itself in Florence might offer some indication of what else we could expect to find there. Images of either are not at present readily available, however. Add MS 35254: the hymn Ave Maria Gratia Plena incorporating a large red initial with contrasting blue penwork. The identification of the initials and miniatures missing from Codice Corale 2 makes possible some reconstruction of this now mutilated volume. Being beautiful specimens of late medieval Italian miniature painting, many of them have been photographed and put into print. Yet this approach perpetuates the treatment of the cuttings as cuttings, in isolation from their original context. It also adheres to the questionable aesthetic priorities that drove their removal in the first place: the privileging of ornamentation over other elements on the page, and the ignoring of what else was written or painted on the reverse. As the example of the single scroll on Add MS 35254 C makes clear, it is impossible to gain a full understanding of this historiated initial – of the many visual, textual and musical ways that the Annunciation was celebrated by the Camaldolese monks who used the book – without knowing what surrounded it, and what else they saw when they looked at the page. The physical reuniting of these cuttings with the gradual which they were taken is not now possible. Yet high resolution digital photography, the development of image platforms to display manuscripts on computer screens, and the potential to share such information over the internet together mean there are great opportunities for collaboration between institutions and collectors in the virtual reconstruction of mutilated manuscripts and their fragmentary ‘diasporas’. In the case of Codice Corale 2, digitisation could advance still further our knowledge of how the book appeared prior to its mutilation; as the example of Add MS 37955 A makes clear, scholars disagree about which fragments on Don Silvestro’s painting belong in which manuscripts. It could also reveal the stages by which the excised leaves were themselves subjected to further fragmentation (as in the case of Add MS 35254 C), clarify what pieces are still missing, and perhaps facilitate their identification by scholars and curators around the world. James Freeman is an Intern in the Medieval and Earlier Manuscripts Section at the British Library, where he catalogues manuscripts and contributes to the award-winning Medieval Manuscripts Blog. He completed his PhD on the manuscript dissemination and readership of Ranulph Higden’s ‘Polychronicon’ at the University of Cambridge in 2013, and will be travelling to the US in 2015 to continue his research with visiting fellowships at the Beinecke, Houghton, Huntington and Newberry Libraries. Explore more illuminated manuscripts through the British Library’s Catalogue of Illuminated Manuscripts. All digitisations are in the public domain.